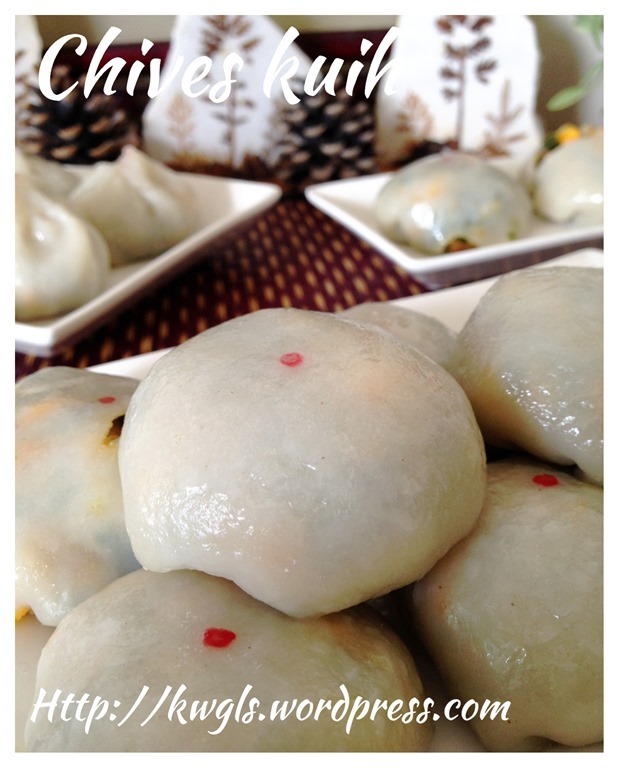 And garlic chives steamed rice cake or ku chai kuih is another one that is common sold. 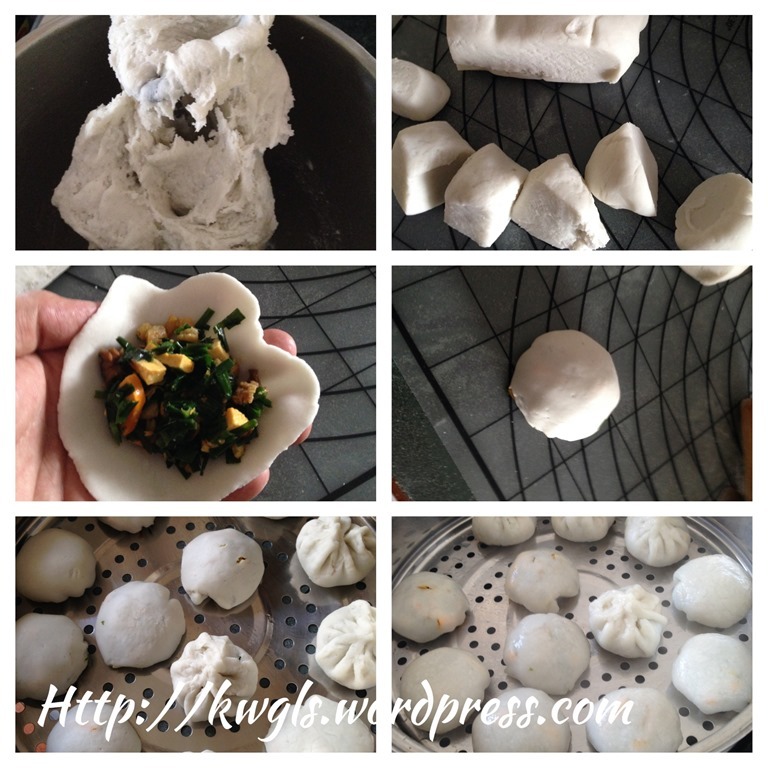 For both soon kuih or ku chai kuih, the crust or “skin” can either be transparent or white. 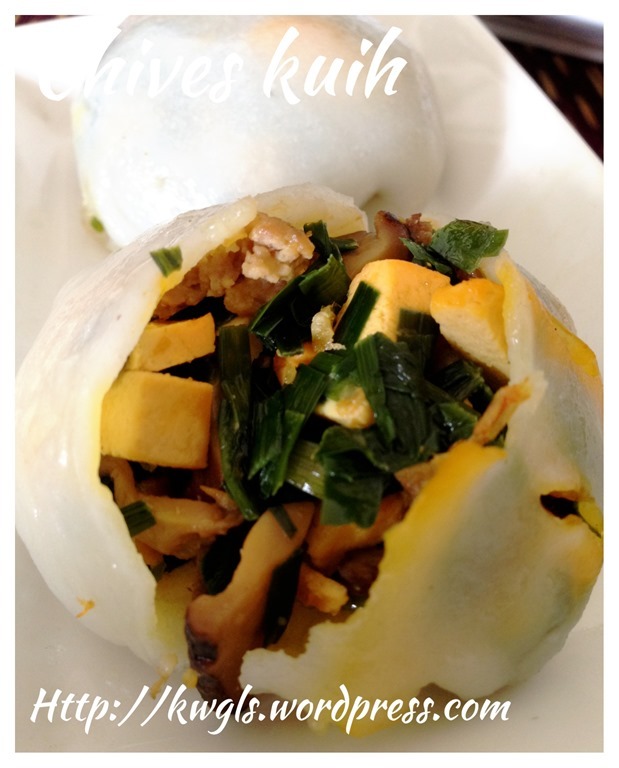 If it is white, it is likely to have more rice flour than starches. 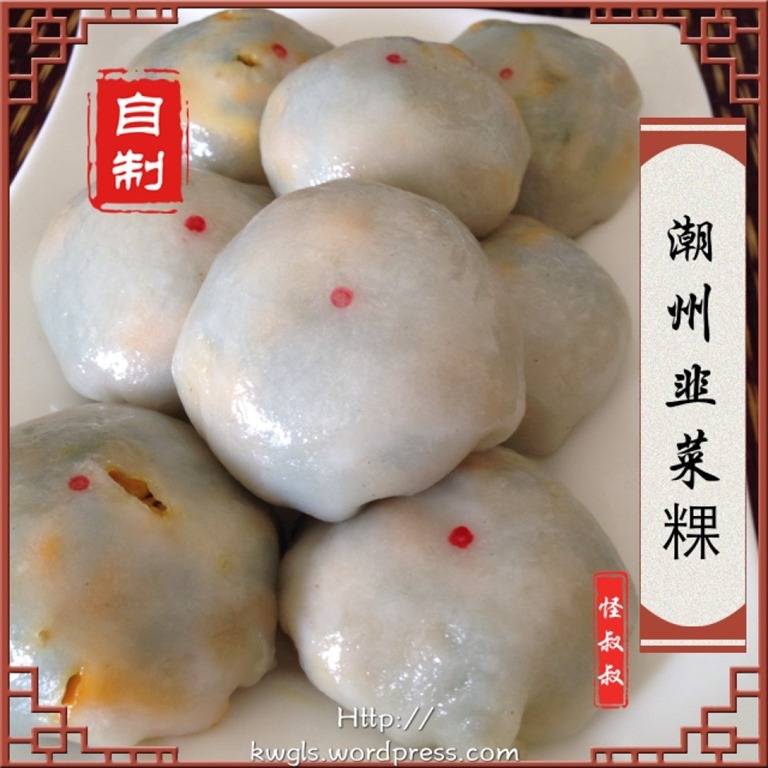 As for those that were called crystal bao (水晶包） with transparent “skin”, it is likely that more starches were used than rice flour. In one extreme, it can be 100% starches being used but this will yield one that is chewy and can turn hard when it is cold. 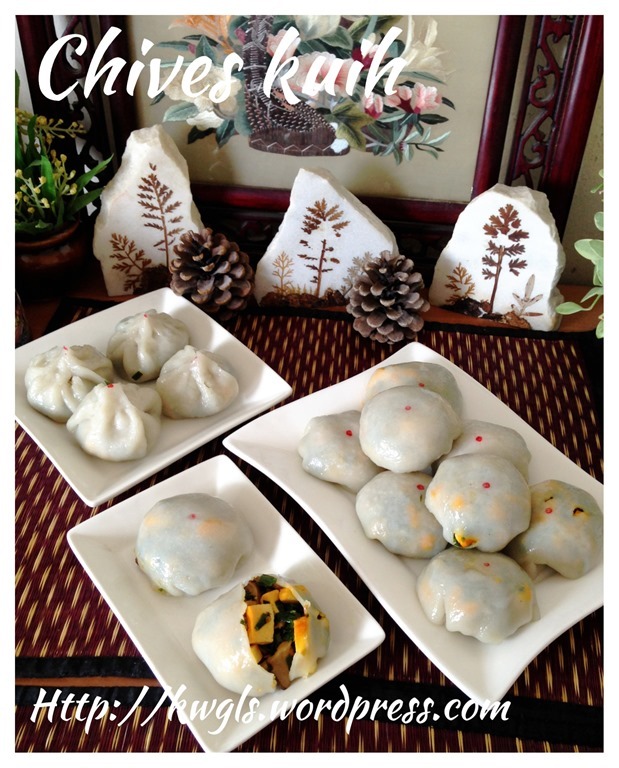 Starches here refer to tapioca starch, sweet potatoes starch, corn starch or wheat starch..
Today, when I am searching for a recipe, I stumbled one rather simple Chinese recipe that do not have beautiful pictures. But it convinced me that it is workable.. 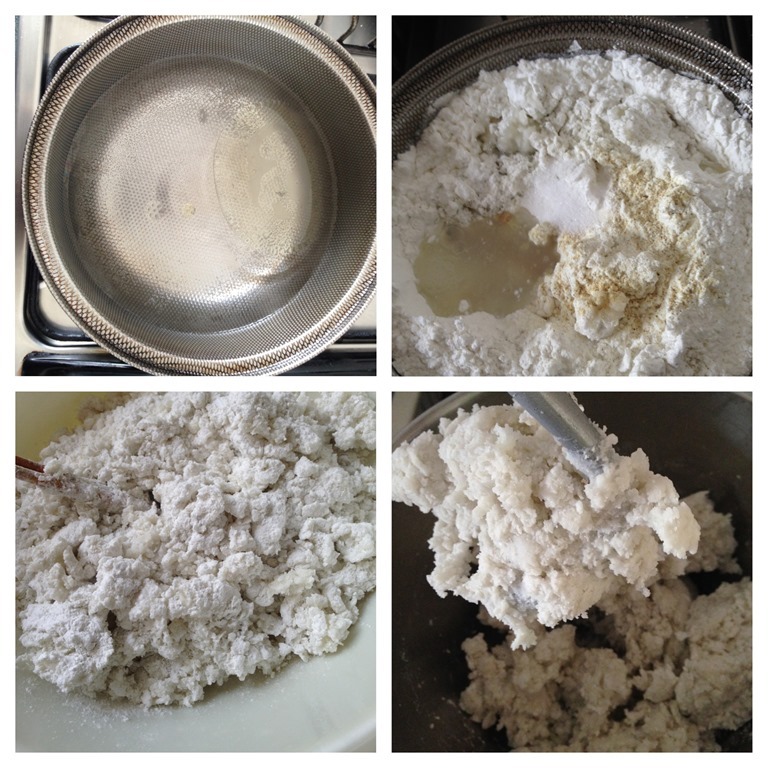 It is a cooked dough method, meaning using hot to boiling water to cook the flour such that the flour is slightly sticky and elastic for the wrapping. I read the recipe with great interest since I recalled hearing someone saying this method before. I have therefore decided to give it a try. The recipes did not disappoint me. It is a balance of chewy and soft… I believed that my flour have very good water absorbing property, therefore, the dough is on a dry side. 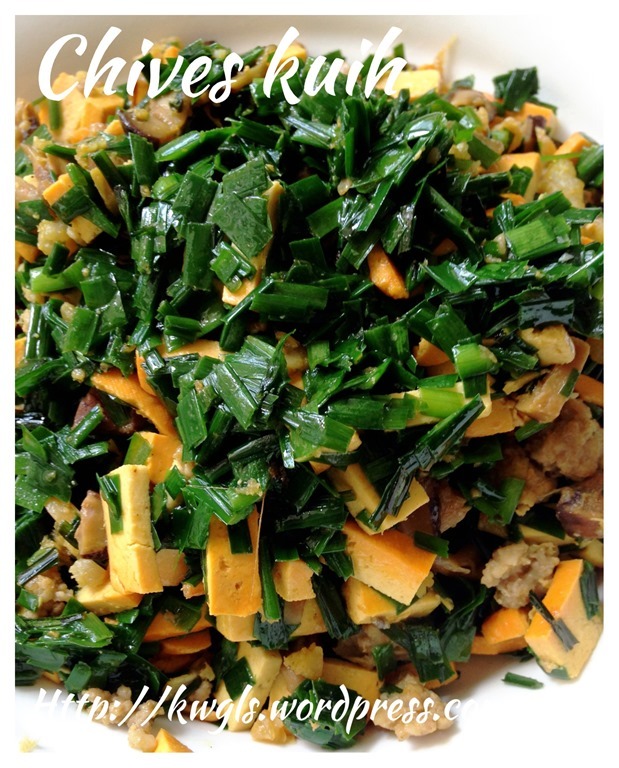 For the recipe, I have adjusted for readers.. It is quite an easy dough to handle. and it did not break easily. 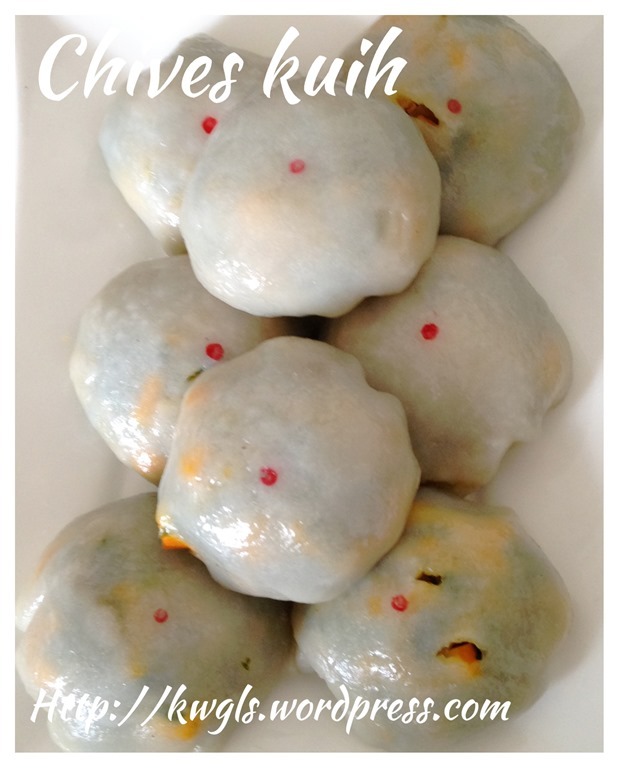 As for the fillings, most store bought ku chai kuih do not have much ingredients except chives and dry shrimps. However, for family consumption, I have decided to add in yellow firm bean curd, dried shitake mushrooms and some minced meat. 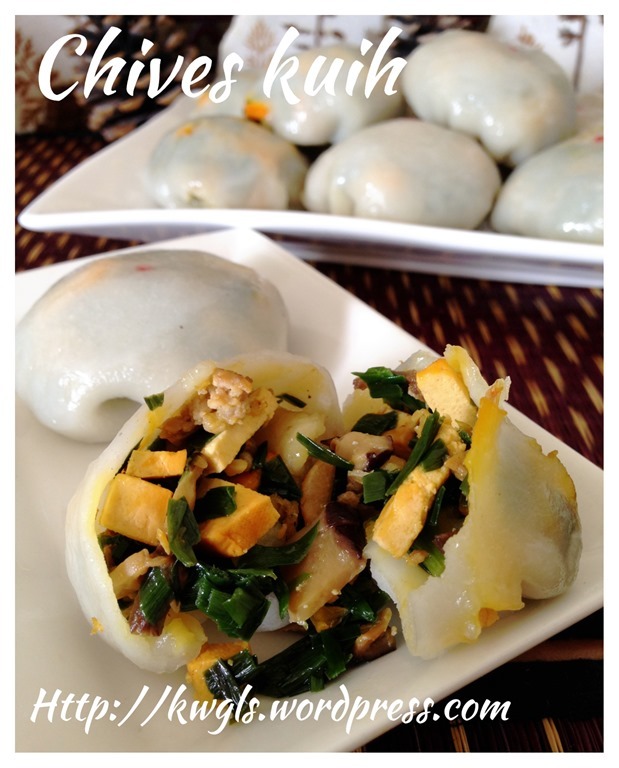 All these are optional but this is my preference as I can’t stand too much garlic chives in the kuih. 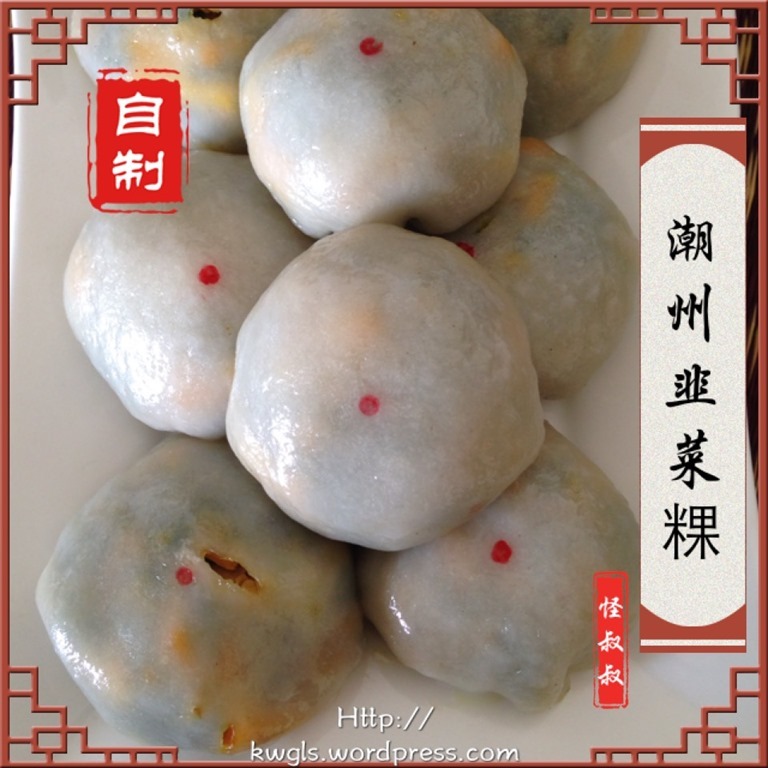 In a frying pan, sauté mushrooms and dried shrimps until fragrant. 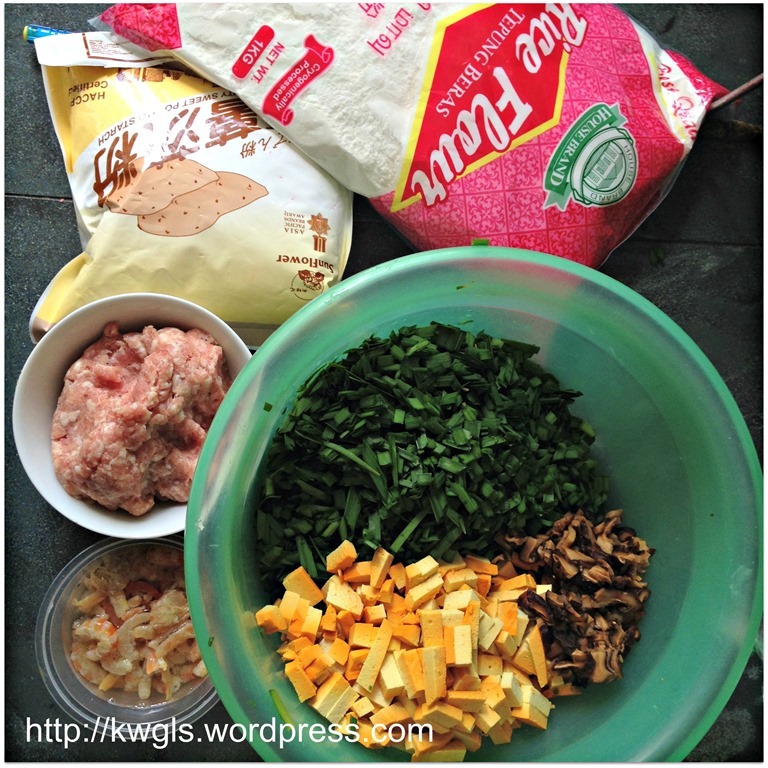 Add in minced meat, stir fry for 1-2 minutes. Add firm bean curd and chives, followed by dashes of white pepper, salt and seasonings. 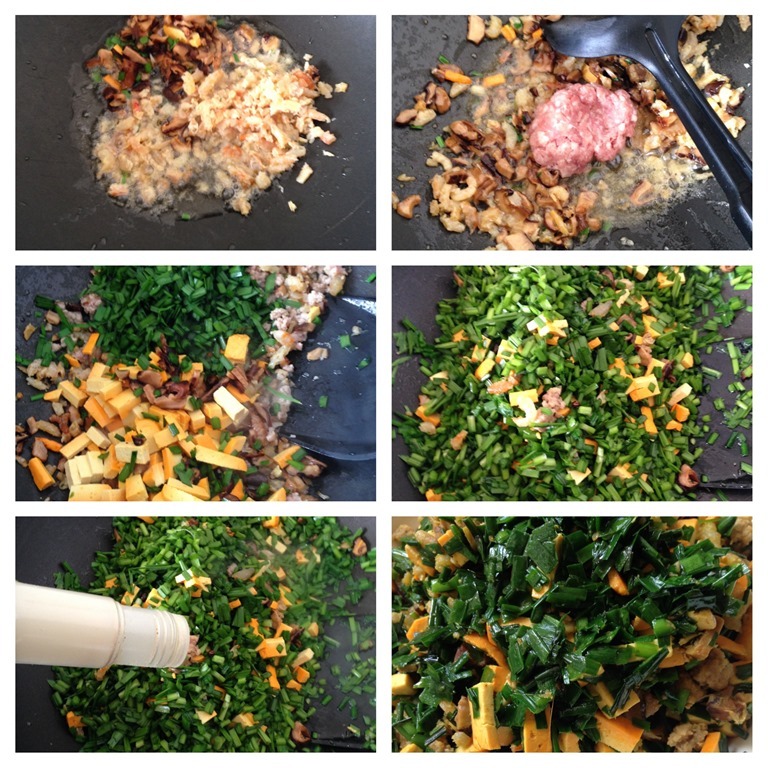 Stir fried until well mixed and the chives are slightly wilted. Dish up and set aside for cooling. In another pot, add water, oil and bring to boil. Once the water is boiling, reduce to medium heat and add in the rice flour, sweet potatoes starch, dashes of white pepper and salt to taste. Use a chop stick to stir until lumps are form. Transfer to the mixing bowl of a standing mixer. Use the machine to knead the dough until it forms a pliable dough. Traditionally, these was done by hand by manual kneading, as I find it too hot too handle, I have resorted to the use of a mixer. Mixer is optional and you can always use your hand to knead if you are able to withstand the heat. Transfer the dough out in a lightly floured surface. Divide into dough of about 30 grams each. Take a dough, shape round, use a rolling pin to roll it flat . Put a tablespoon of the filling on the dough, sealed the edges and put the flat side as top of the cake. Transfer it to a lightly oiled steamer tray, steam under high heat for about 10 minutes or when the skin looks slightly transparent. Best served hot when out of the steamer. To avoid the steamed cake from getting hard when cooled, after cooling, the steamed cake have to be kept in an airtight container. Otherwise, due to the loss of moisture vapour, the skin can easily turn hard. If it turns hard, re-steamed again and it will be soft again. Do give it a try and remember that for the fillings, only chives and dried shrimps are necessary. All other ingredients are optional. 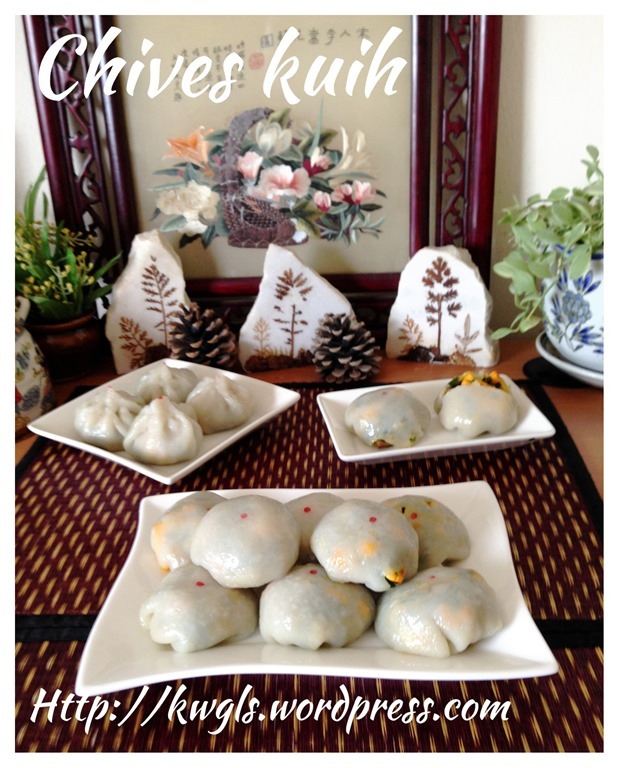 This entry was posted in Chinese and Asian Cakes and Snacks, Food Preparation Series and tagged GUAI SHU SHU, guiahsushu, kenneth goh, koo chai kuih. 韭菜粿，潮州粿， 8， postaday, ku chai kuih. Bookmark the permalink. 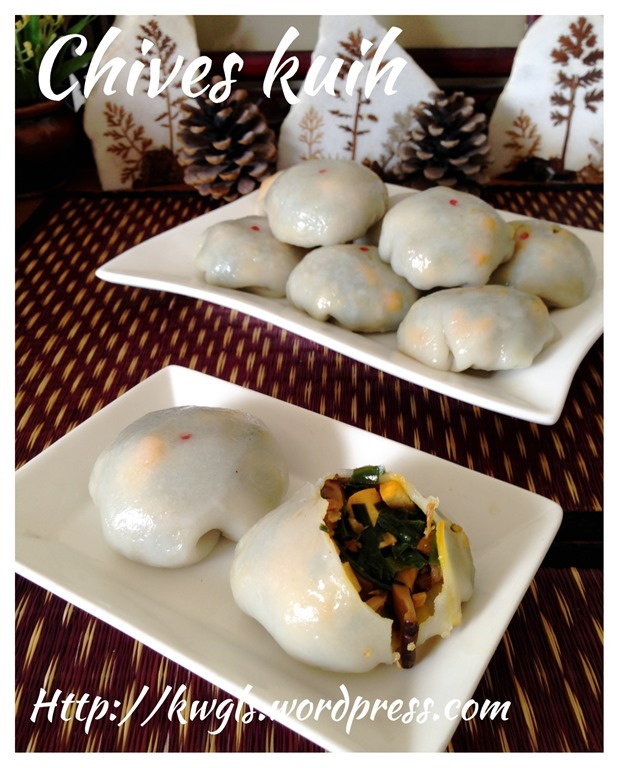 Hi Kenneth,these ku chai kuih is my favourite,I always bought it from night market,but is quite expensive now, I think I should try to make it myself. Do you now the new theme for Best Recipes is [My Favourite Traditional Kuih]?Hope you can join us with your yummy ku chai kuih. 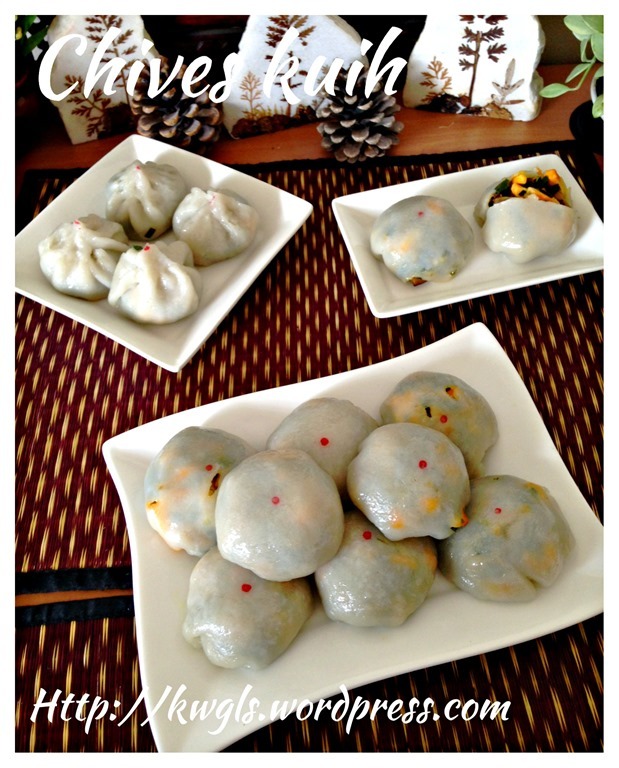 everything tio ciu kueh i like, made from rice, vegetable d love , that’s why looks pretty d yummy. do give it a try and tell me if you like it. Kenneth Sifu ! 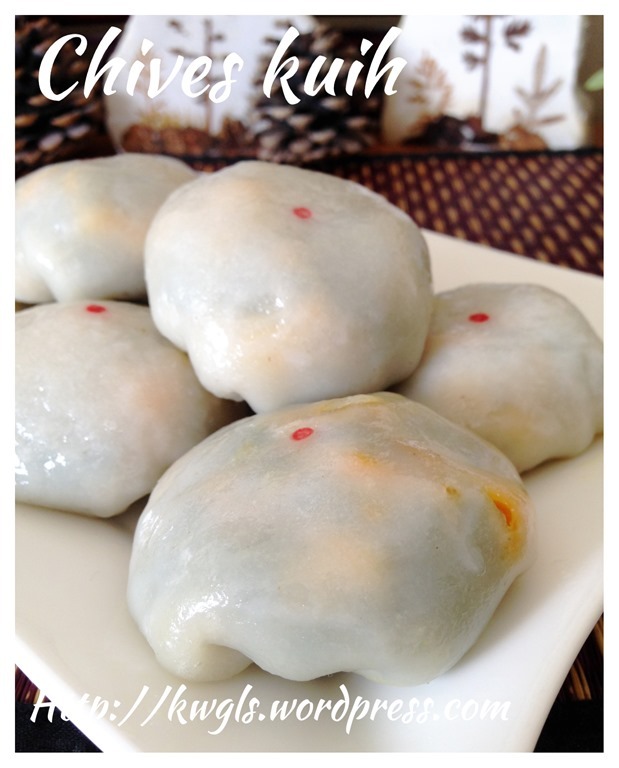 Can i omit sweet potato flour…replace tapiocal flour.Chives kuih. Hi Mr Goh, I loved teochew kway very much. I have tried your steps, but I think I had added too much flour. After steam, the skin of the kway has become too hard. Now I still have half of packet of kway skin. Any solution for the balance to soften it, I do not want to waste it, please advise.